Built in 2016, the 107-meter Ulysses has become the clearest yet definition of an explorer yacht, incorporating swimming pools, spas with a helipad and a myriad of tenders, the largest of which is 22-meters long. Sold just a few weeks before the end of the season by her original owner, Graeme Hart, she became the largest brokerage yacht sold so far in 2017 with an asking price of $195 million. Ulysses' story starts back in 2013 when Graeme Hart, whose net worth is valued at $10.2 billion by Forbes, commissioned the 107-meter yacht (351 ft) from Kleven, a shipyard in Norway that builds commercial ships. According to designers, Hart's choice was driven by quicker delivery times, a better price point than traditional yacht builders and high enough quality standards. The most unique feature amongst the whole boat may however be the 21-meter tender that Ulysses carries on its bow. The two-deck boat, which most would call a yacht in her own right, requires two custom built cranes to lift in an operation that takes just over an hour to execute. Delivered in 2013 by Germany-based Lurssen, Solandge was built under the codename Project Niki and based on a similar engineering platform to renowned superyachts such as the 88m Quatroelle or 87m Ace. First listed for sale in August 2015 at an asking price of €179 million, the yacht later went through two price reduction and a central agency change. At the moment of sale the asking price for Solandge was €155,000,000. The superyacht can sleep up to 12 guests in 7 staterooms, including a panoramic master deck featuring 180 degree windows, private dressing room, his and hers bathrooms and a private deck with spa pool. Performance wise the yacht reaches a top speed 18 knots and comfortably cruises at 14 knots. Built in 2009 by Lurssen, the 75m Northern Star was the third largest yacht sold this year. The superyacht's interior has been designed by Pauline Nunns and exterior styled by Espen Oeino. Featuring a 'country house' style interior Northern Star can accommodate 12 guests in six staterooms. She also has room for up to 22 crew so that your every need can be taken care of while on board. The yacht's astonishing amenities include a gym, helipad, tender garage, swimming platform and jacuzzi. First listed for sale in December 2012 by her owner at an asking price of €129 million, she went through a series of price reductions over her near five years on the market before ultimately selling in June 2017 asking €83 million. Extremely controversial when first launched in 1991, Eco was designed by Martin Francis at the request of the late Mexican media entrepreneur, Emilio Azcarraga, primarily known for owning the largest Spanish-language television network in the US and Mexico. Searching for an art deco look for Eco's interior, Azcarraga recruited Francois Zuretti, the designer then known for his work in the Mamounia hotel in Marrakesh, to design the interior of the yacht, as his first ever marine project. Zuretti was not the only yacht designer to get his start on Eco as both Espen Oeino and Dan Lenard worked on the Eco project at some point during its development. Five years later Ellison took delivery of the 138-meter Rising Sun (later sold to Dreamworks founder, David Geffen), which led to him selling Katana to British media entrepreneur, Aidan Barclay, owner of the Telegraph newspaper, who renamed the yacht to Enigma. In 1999, two years after the death of Azcarraga, Eco was sold to American billionaire and founder of Oracle, Larry Ellison who renamed the yacht to Katana. Ellison also refitted the yacht, adding a basketball court aft of the main deck. The yacht later served as a mothership to his America's Cup campaign in New Zealand. The yacht was then refitted in 2009 and then again in 2014 by the Barclay brothers. In August 2016, Barclay listed Enigma for sale at an asking price of €47,500,000 and her sale has now been confirmed without any price reductions announced. Following the sale, the yacht was renamed to Zeus. Listed for sale in the summer of 2017, she was sold shortly after in November. Her asking price remained undisclosed. Her support vessel was the 67-meter Sea Axe, 6711, which is currently looking for a new owner. The first hull built by Dutch shipyard, Icon Yachts, on its 62.5-meter platform, Icon was sold in October of this year after spending over a year on the market in her fully refitted form. Originally listed for €62,5 million, the yacht underwent several price reductions until it was eventually sold. Designed by Redman Whiteley Dixon, Icon's most attractive features include a large glass-bottomed spa pool, an extensive beach club, a hamam and a sauna. Extended by 5 meters during her refit in 2014, the yacht now has a length of 67.5m. Icon is capable of accommodating 12 guests in 6 cabins and carries a crew of 17. From a technical standpoint, the yacht is powered by twin MTU engines of 2,480hp each giving her a maximum speed of 16 knots. The yacht is also now for charter. 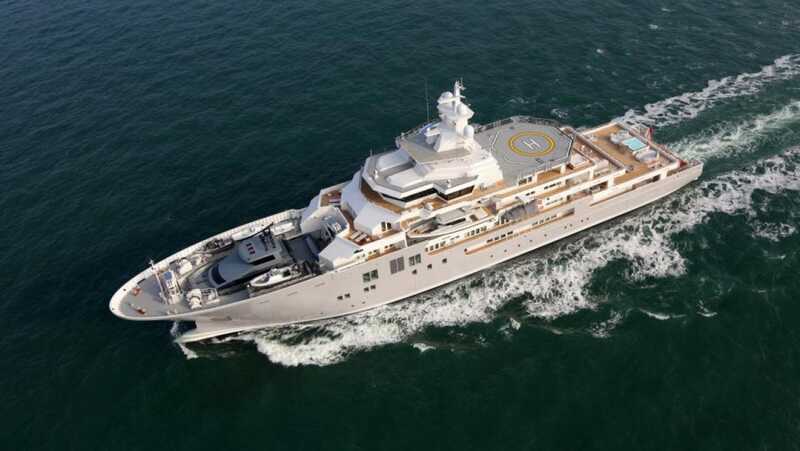 Natita, a 271-foot luxury yacht, was delivered to Russian billionaire Alisher Usmanov in 2005. Goldman eventually filled a suit with the Miami federal court to have the boat seized, which the US Marshals did at a West Palm Beach marina. The bank's first act as acting owners was to purchase $67,000 of fuel for the yacht to keep the generator running, fillings show. Eventually, the bank was able to sell the yacht for $39,9 million. Launched in 2006 as Royal Denship's hull 327, the 64-meter yacht was christened Turmoil. She was then listed for sale in 2012 at an asking price of $50 million. Earlier this year, the yacht was sold at an asking price of $48,500,000. Built for the owner of the 46-meter Palmer Johnson of the same name, his first expedition yacht, Turmoil featured a scientific climatology lab as well as research facilities intended to examine the effects of global warming on the world's oceans. Powered by twin CAT engines of 2,260hp each, Turmoil has a range of 6,500nm at 12 knots. With a cherry wood interior, it can welcome as many as 16 guests in 8 cabins. A master cabin is located on its own private deck. Following the transaction, the yacht was renamed Albula. Originally delivered in 2002 by Oceanco, the Dutch superyacht shipyard, as Lady Lola, the yacht was refitted in 2005 with the addition of a convertible helipad. In 2011, the yacht then changed ownership at an asking price of €36,8 million, which saw its interior being redesigned and its master cabin remodelled. In 2015, the yacht came back on the market asking just under €50 million. A series of price reductions then brought her down to $39,750,000 at which asking price she sold in January of this year. Following the acquisition, the yacht was renamed to Lucky Lady and put on the charter market under her new name. Amenities onboard include a hot tub on the sundeck with a waterfall feature, large windows in her full-beam sky lounge, a master cabin with a 180 degree view, forward on the bow. Delivered in 2008 as part of Benetti's highly popular 59-meter line of superyachts, Dynasty, as other yachts in the line, features lots of interior volume. First put up for sale in 2013 at a price of €36 million, the yacht was refitted in 2015 with a full repaint of the yacht and her hull. Sold in July 2017 at an asking price of $29,5 million, I Dynasty features a bespoke interior with intricate fabrics and lines throughout the yacht. Combining a mixture of dark wood and white furniture, the yacht can accommodate 12 guests in 6 cabins.